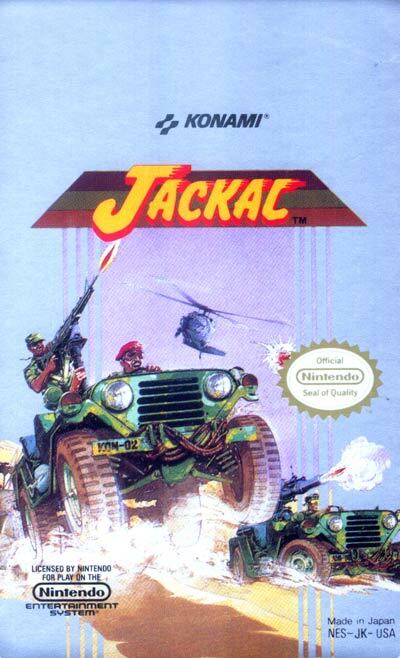 In Jackal, the player(s) controls an armed jeep, which must venture through several enemy strongholds(要塞) to rescue comrades imprisoned by the enemy. In each of the six levels, the goal is to rescue prisoners of war from various buildings and then transfer them to helicopter dust-off locations. Once the soldiers are secure, the player(s) must then proceed to defeat the boss at the end of each level. In the last level, there are two bosses that must be defeated. As with most run and gun games, there is a point system which can grant the player extra lives depending on the score attained. Rescuing more prisoners gives yields a higher point bonus at the conclusion of the level. If you a collission occurs with an enemy vehicle, or the jeep is hit by one enemy bullet, a life will be lost. If death ocurs while four or more prisoners are in the jeep, only four will be available to be picked up again, as the rest will disappear. Some buildings contain one flashing prisoner; if this man is rescued, the jeep's primary weapon will be upgraded. In addition, if enough prisoners are rescued, a weapon upgrade will be yielded during the unloading process to the rescue helicopter. Each jeep can hold a total of eight prisoners and will not accept any more once capacity is reached. A common strategy is to fill up with only seven prisoners to keep room for the flashing prisoner.